Update January 13, 2015- Yet another study was published highlighting the risks of daily aspirin. We have been the most vocal critical of aspirin for primary prevention for at least five years. 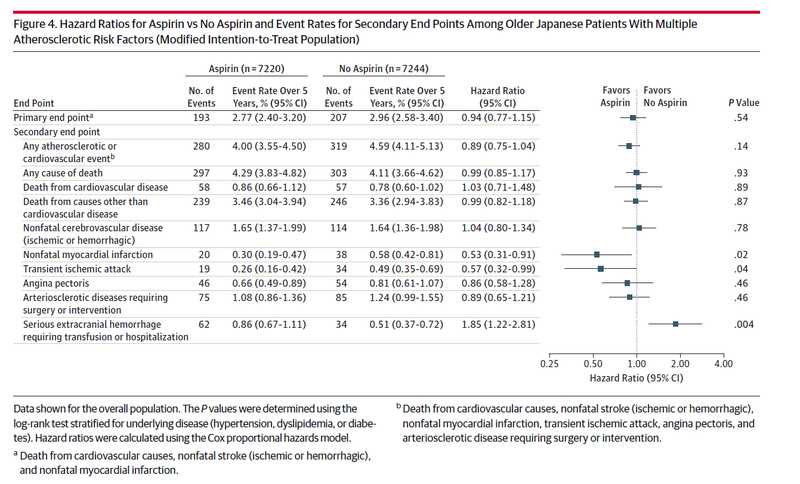 A Japanese trial of daily aspirin for primary prevention of stroke and MI, published in JAMA, showed no statistically significant benefit in those outcomes. However, the study did show, once again, that daily aspirin increases the rate of serious GI bleeding. Intracranial bleeding was also increased (click image above for full-screen). This entry was posted in - JAMA, - Pharma, - Policy, Cardiac surgery, Cardiology, Gastroenterology and liver, General surgery, Neurology, Neurosurgery, Oncology, Primary care medicine. Bookmark the permalink.